Why choose Jayware when shopping for a new car? Our Market based Value pricing is achieved by scanning over 20000 Pre-Owned Websites Hourly. We do not Charge ANY added FEES-Dealer prep etc. You do not have to finance with us to get these Market Based Value-based Pricing. We Work With All The Major Banks as Well As credit Unions. We Can Help you Get The Best Rate and Term To Fit Your Budget. Never be Surprised -You Will Know EXACTLY what Your finance terms are before you come in! Don't Just Take Our Word for it - Check out Our Reviews-They Say It All. We Are Proud to be a household name here in Suffolk And Nassau County's for over 30 Years! Help Us celebrate our 30th Year in Business! We Have been in Business Longer Than Many Of the New Car Dealers on Long Island! No Big Secret To Our Success-Great Cars, Great Prices, Pride & Honesty in What We Do. I went there looking for a car for my daughter, I saw a special on a Volvo and fell in love with it although it was already sold… well the deal fell through and I purchased the car. All I have to say is Joe and Bill were awesome and were thorough in making sure the vehicle was a close to perfect before delivery. I will be buying another vehicle from them for my daughter in the future. Thank you guys! Just bought my 2nd vehicle from Jayware. Joel was awesome!! My previous vehicle I bought in May 2016, a 2002 Chevy S-10 and it is still running great after I put on 40,000 miles. Just bought a ’09 VW Jetta 2.5L. So far, running perfect. For a 9 year old car it is in amazing shape. Looks beautiful. There were 2 VW recalls on it for ABS, Jayware brought it to VW and they took care of it. I believe, you can trust a place that lets you access carfax online for free. Plus, they will provide a printout while there. They may not have 100’s of cars on their lot, but it appears to me they prefer to sell Quality vehicles. I was looking for a replacement vehicle for my daughter. I passed this dealership a few times and decided to check out their website. I found a Buick SUV which was in excellent condition low mileage clean vehicle with one previous owner. The salesman Joel was great from the minute I started talking to him it was like speaking to an old friend. The entire sales process was great and they stand behind their vehicles. I would definitely recommend checking out this dealership. I went to Jayware to look for a car for my daughter. I met Bill on the lot. He was very patient, knowlegeable and funny too. I found the perfect car and they treated my like a VIP. The owner, Jay, and his staff made the whole process a pleasure. I highly recommend this dealership. After searching around the island for our son’s first car, we ended up at Jayware. I can’t say enough good things about this dealer. we found the perfect car at the right price, As a matter of fact it was thousands less then other dealers were offering for the same make and model with similar mileage. Our experience from the beginning to end was nothing short of spectacular. The sales staff is very knowledgeable but they do not pressure you at all to make a sale. the paper work process was fast and smooth and the car was ready for pickup when promised. if your looking for a quality pre-owned vehicle, save yourself a lot of time and go to Jaywar. you will not be disappointed. excellent service,great prices. 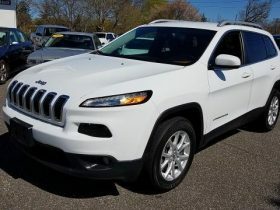 I am very pleased with my 2007 jeep Cherokee. I recommend Jayware to everyone. The atmosphere is very nostalgic as well. The salesman treat you like family. Jayware has excellent pre-owned cars with trustworthy sales consultants that helped me find my dream car. I recently purchased a 2006 BMW X5 from them and couldn’t be happier with the service I had received. When I had a question I called and left a message in which they got back to me within the hour. They are very courteous and pleasant to deal with. I highly recomend Jayware Auto to anyone who is looking for a great value of an excellent product. Dealing with Jayware was fantastic. They were absolutely amazing to deal with. I felt completely comfortable throughout the process. Not only did they deliver on their word, they went above and beyond to make the transaction as seamless and stress-free as possible.